Quite frankly, we think that EVERY day should be a Flower Day! Giving and receiving flowers for no other reason than someone thought about you - or you them - is a very good reason for 'a Flower Day'. There are however some nationally and internationally recognized dates that have been given special status and are marked by the giving and receiving of flowers... what a wonderful thing. Valentines Day is a wonderful celebration of love and lovers. Typically, red roses framed with Baby's Breath are given. The red rose is the flower of love. An important Christian holy period that commemorates and celebrates the death and resurrection of Jesus Christ. Many colourful varieties are used worldwide at this time. Easter day itself falls on the 16th April and at this time houses and churches are filled with colourful flowers as a symbol of rebirth. Mothers Day always falls on the second Sunday of May. Although pink flowers are traditionally given to moms on this day - no-one quite knows your mom as well as you do! So give her a bunch of something you know she would love in whatever shape, colour, size or form. Father's Day is celebrated on the third Sunday of June. Traditionallyred roses are given to a living father and white roses are given (or worn) for a father that has passed away. But you know your dad best! A mixture of his favourite edibles with his favourite flowers may be just the thing. A day to celebrate and honour the strength and courage of women in South Africa. Gladioli and Orchids are indicative of strength and character although any bright and cheerful flowers would be appropriate. From a sprig of Jasmine behind your ear to an elaborate arrangement on your dinner table - nothing quite says 'Happy Spring' like fresh flowers! This is one day in the year that has been specifically set aside to recognize the input from secretaries, receptionists and administrative assistants. A posy basket for her desk would be appropriate. A day to show your love and appreciation to our wonderful teachers. 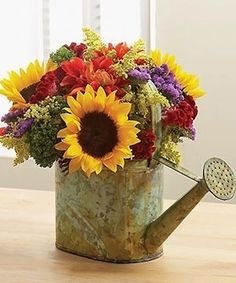 A small mixed bunch of fresh flowers in a jug, or mug would be perfect for her desk. We don't think that there is a Granny in the world who wouldn't want to receive fresh flowers on this Day with a special note attached telling her how much she is loved! A simple bunch of her favourite flowers would be perfect. And for Grandpa? A hamper of his favourite nibbles would not go by unnoticed! A day to show your appreciation to your boss. Your lady boss may well love to receive a posy basket for her desk and your gentleman boss may prefer a hamper. A wonderful festival of lights to commemorate the triumph of good over evil. The celebration is marked by lighting candles, firecrackers, exchanging sweets and gifts of flowers. A posy with a candle or two in the center makes a perfect gift. Mixed hampers of flowers, fruit and chocolates would also go down a treat. A pivotal day in the Christian calender. This is a day the celebrates the birth of Baby Jesus. Flowers are a lovely gift to send to a loved one. Traditionally red Poinsettias, Hydrangeas, Cacti and Ivy are given but quite frankly all flowers are given the go ahead on this celebratory day. Giving from the heart - something that you know the person will love - is really what Christmas is all about. Hampers and baskets are also wonderful Christmas gifts. The Language of Flowers has always been a way of communicating without using words. Specific meaning has been given to various flowers to convey a simple but cryptic message. The most obvious one that still thrives today is giving red roses. Giving red roses is a declaration of one's love. In the Victorian era particularly, gifts of blooms and hand-picked floral arrangements were used to send a coded message to the recipient, allowing the sender to express feelings which could not be spoken aloud. Yellow roses – Friendship and/or Infidelity!